Access All Areas members have a great collection of vector illustrations to download this week, courtesy of Adrian Pelletier. 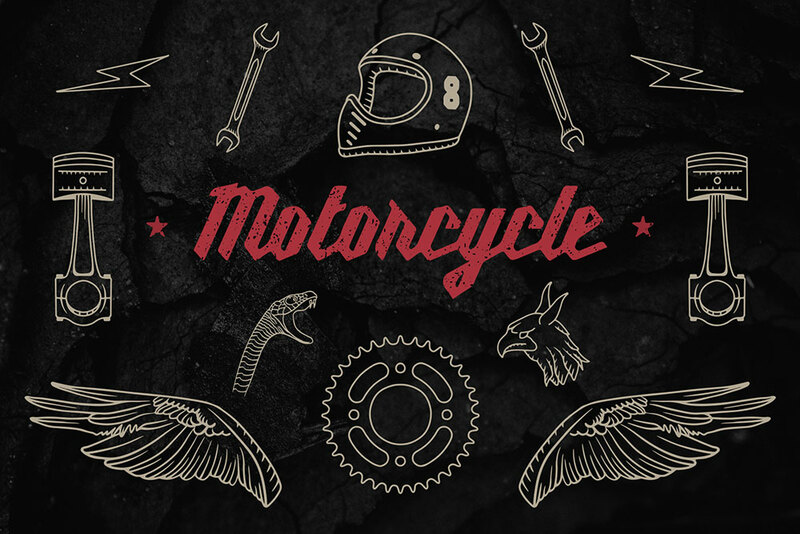 This set of Vintage Motorcycle Elements contains various vector drawings with an old-school, industrial style. Combine the illustrations of skulls, wings, flames, pistons, snakes and more to make the perfect retro racing poster, automotive emblem, sticker design, or anything a gearhead could want! Adrian Pelletier, the founder of Build Interactive, spends his time restoring classic cars and enjoying the outdoors when he’s not behind a desk. These passions clearly influence the design resources in his Creative Market store, which contains lots of quality logo templates and vectors with a strong vintage style. For a great deal on more elements, check out Adrian’s new set of Lines Badges, featuring 6 ready-made vector designs with an outdoors vibe, perfect for camping or nature themed designs. This set of vintage motorcycle elements contains a variety of vector illustrations in AI and EPS format, as well as PSD Smart Object and individual PNG graphics for use in a variety of design applications.